I have a lovely client named Alisa, from The Ladies of History, and for her next cosplay she would like to be Catherine the Great. 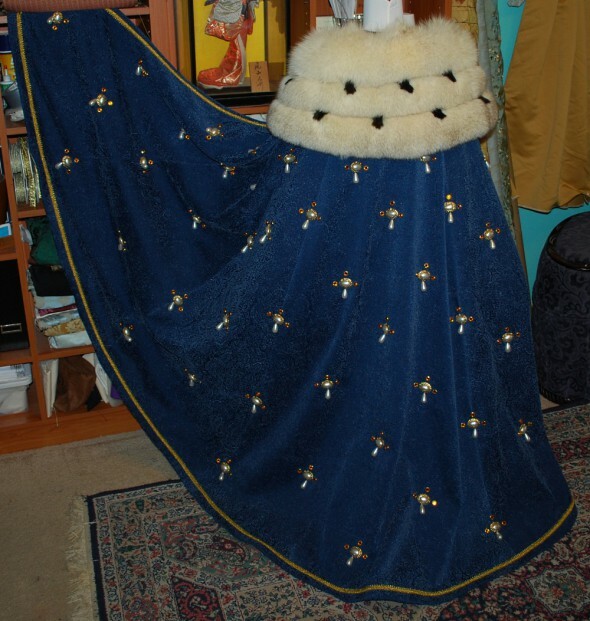 She sent me three and a half yards of blue velour upholstery fabric and a vintage fur stole to make the cloak with… Only 3.5 yards? With a nap? For a cloak? That has to go over an 18th century gown? I just about fainted. It couldn’t be done! Cloaks need loads of yardage to look nice, a skimpy cloak just looks stupid, especially if you’re going to portray a Queen! I had no idea how I was going to make this work.